Aviation has moved on in leaps and bounds since the Wright Brothers first flew their heavier than air craft. It took place on 17th December, 1903, flew twenty feet above the ground for a distance of 120 feet. It is said, and I do not know whether or not it is true, that their flight in relation to height and distance could have taken place inside the fuselage of a Boeing 747. 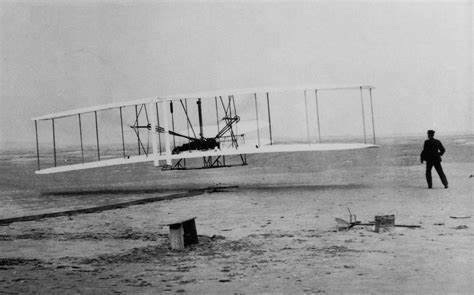 When Orville Wright tried desperately to encourage the US Army to take up the idea of flight and its military advantages, he attended Fort Myer, Virginia on 17th September, 1908 to give an exhibition. 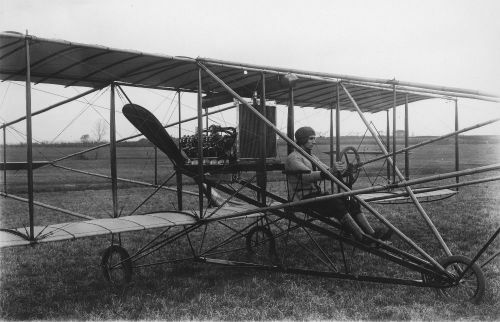 He was joined in his aircraft, the Wright Flyer by Signal Corps Lieutenant Thomas Selfridge. They circled Fort Myer several times – four and a half times in fact – at a height of 150 feet. Suddenly there was a shuddering: one of the two propellers broke thereby causing the plane to drop to the ground nose first. Orville was not seriously injured whilst the unfortunate Selfridge was killed by a fractured skull. 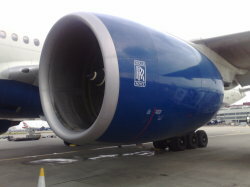 The next time you take a flight, consider the following fact: The engine of your plane is highly likely to have been manufactured and supplied by Rolls Royce. Yes – the same people who used to make those expensive beautiful cars. 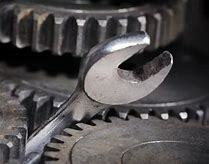 The company, formed in 1906, is the second largest supplier of aircraft engines in the world. 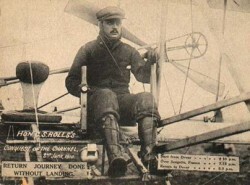 Charles Stewart Rolls, who formed the company with Frederick Henry Royce, was an early aviator and in fact obtained British Pilot’s license number Two. (The first official UK pilot’s certificate No1 license was given to Moore-Brabazon – an early aviator). In 1921, she somehow got herself to France and with her savings she enrolled in an aviation school. She returned home and became famous by performing in many air-shows. She earned the name ‘Queen Bess’ and was the darling of the press and media. 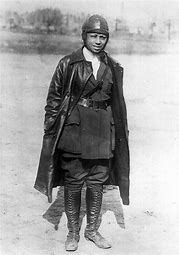 She became the first black US pilot in 1921. Whilst practising for an air-show on 30th April 1926 in Jacksonville, Florida she and her co-pilot (who was also her mechanic) William Wills in her aircraft – a Jenny Trainer – she was scouting for a parachute landing site. As she leaned over the edge of the cockpit and whilst not wearing a seatbelt, the plane suddenly lurched forward and started to roll. Bessie was thrown to her death from a height of 1,500 feet. Wills could not regain control and was also killed when the plane crashed. It is nice to know these facts. I did not know all of this and thanks. Thank you Wendidawn: When flying Irish airlines, it feels like you are back in the early 1900's................only joking really - at least Ryan Air really is a joke..Mike..
Oh, so you take your life in your own hands while flying that airline? Huh? Thank you Wendydawn: a few years ago Ryan Air advertised flights to Europe for one penny each way. When you tried to book a flight it was found that there was about twenty pounds airport duty, a fuel surcharge, baggage handling charges, seat booking fees and others I cannot remember resulting in the actual fares being as much as other carriers. They are famous for their misleading ads. Mike. WOW!!! They left out the details of the actual cost. 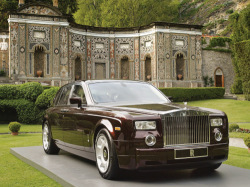 I had never heard about this and especially about Rolls of Rolls Royce. Wow....the things you learn. Great write. very interesting stuff here...I am afraid to fly so I will stay safe on the ground. Thank you Anamaria: After a truly frightening experience when flying many, many years ago, I vowed never to fly again. Instead, when going to Ireland, I would drive the 300 miles and take the Car Ferry. When the children were young at the time it caused a lot of inconvenience. Many years later, my truest best friend died back home in Ireland. I was shocked that he was to be buried the next day and it was impossible to get a Ferry ticket. There was no alternative. I made up my mind to fly. On the flight, I made a concious point to sit by a window and force myself to look down. I had no fear whatsoever and really enjoyed the experience. Since then I have flown dozens of time with no apprehension or fear. I now look forward to doing so again......and again.....and again. You should try it...............Mike.. I fear going up in a plane. Coming down for the landing is ok as I know I will be on ground again. I am afraid of height. Anamaria: I think the fear or height is connected. Three times in my life I have had severe attacks with the strangest one being when I was stepping off a pavement. The ground just kept falling away more and more. How I cured it, if in fact it can be cured, was that I would purpously stand on the edge of pavements and look down. I was able to step down and reasoning that it was madness to have such fear. I fully understand what you say but if you can try, try to conquer your fear little by little. It is a fact that less people die on aeroplanes than do crossing the road - even on a pedestrian crossing.....Mike..